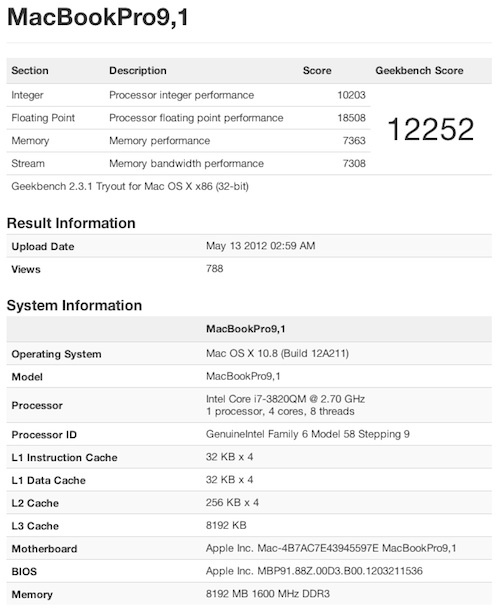 The first real evidence that a next-generation MacBook Pro and iMac exists, comes in the form of Geekbench benchmark results. These system benchmarks were discovered in Geekbench’s database, and have lead to flurry of speculation. First up, is a benchmark for a MacBookPro9,1, which is a model number that corresponds to no product on the market as of this moment. The current Pro models are labeled MacBookPro8,x. This can be easily faked, yes, but the system specs match up nicely with the rumored internals coming in the next-generation MacBook Pro. This new machine, according to the benchmark, has a 2.7GhHz Intel Ivy Bridge Core i7-3820QM quad-core processor. It is a 45-watt chip, making it unlikely that such a chip will make it’s way to the 13-inch model due to its smaller battery. Overall, this machine scored a 12,262, compared to 10,500 compared to the Core i7-2860QM found in current MacBook Pros. As for the iMac, it is marked as a iMac13,2, which would correspond to a new 27-inch iMac model. Again, this machine has a beefier 3.4GHz i7-3770 quad-core processor. This new model scores at 12,183 compared to the 11,500 of the current Core i7-2600 processors. It would seem that significant updates, at least in regards to horsepower, are in the pipeline. Following up these benchmarks comes a report from 9to5Mac, which claims that the next-generation 15-inch MacBook Pro will be considerably thinner than the current Pro design. Their source claims that the machine will look essentially the same, but will have a reduction in thickness due to the removal of the optical drive. In short, it will look like a thiner MacBook Pro, and less like the tapered MacBook Air design as had been previously rumored. It seems that this will be a truly “pro” machine, with all of the ports that are reportedly included. The right side will offer a pair of Thunderbolt ports, a USB port, and SD card slot, and a Kensington lock slot. The left side will have two USB ports, audio in/out jacks, MagSafe power connector, and battery indicator. The report is unsure as to whether the new Pro will retain FireWire connectivity. However, they are certain that the dedicated ethernet port is gone. Users will have to rely on a USB-to-enthernet dongle if they want to connect via hardwire. The report also notes that the new MacBook Pro will have a “Retina” display, which should come as no surprise considering HiDPI graphics and settings have been popping up in the latest builds of Lion and Mountain Lion. Lastly, this 9to5Mac report claims that the USB ports will be USB 3.0. This claim seems fishy considering Apple’s push for their own proprietary Thunderbolt connectivity that they developed with Intel. However, this claim isn’t totally dismissible, as other reports dating back to last year, claimed that Apple was still considering the use of USB 3.0 in future machines. As for the launch timeframe, a report from Bloomberg states that Apple will be introducing these new machines at WWDC which kickoff on June 11th. This report also claims the machines will include flash memory to cut down on startup times. A vague, precise report like this strikes me as one of Apple’s controlled leaks they have been known to use in order to drum up hype ahead of a launch. Besides, what better time would there be to introduce a new Pro machine, than at a pro-user conference? Not to brag, but all of this fall in line nicely with what I predicted awhile back. These new MacBook Pros won’t be as thin as the MacBook Air, but most certainly will be thinner than current MacBook Pros. I still wager this extra room is for the beefier internals, yes, but more likely, for traditional higher-capacity Hard Drives with moving parts. The high-capacity that pro users demand, is still economically unfeasible in today’s solid state drives. June 11th is right around the corner, and I have a sneaking idea that these report hit the nail right on the head. I would expect slimmer, more powerful MacBook Pro to be released very soon. 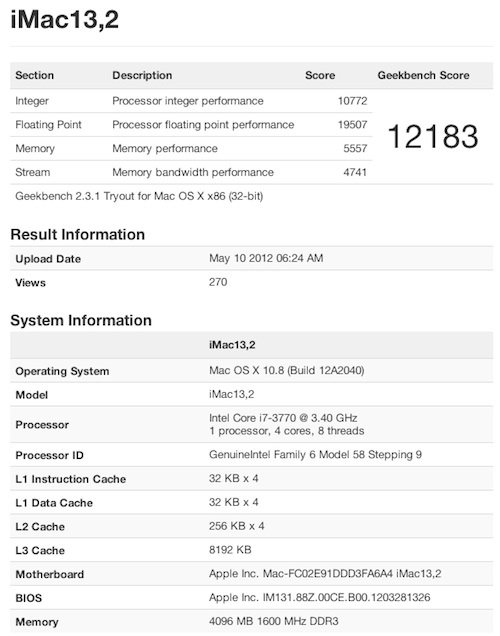 Images courtesy of Geekbench and 9to5Mac.